It is a great pleasure to be here, and we extend our particular thanks to the United Kingdom for being the catalyst for today’s event, as well as Botswana and Vietnam, both of which have hosted important and highly successful conferences on illegal wildlife trade. It is also wonderful to see Thailand on the programme, the host of the 16th meeting of the Conference of the Parties to CITES back in 2013, where its proposal to declare 3 March, being the date CITES was signed, as World Wildlife Day was adopted unanimously by the CoP and subsequently by the UN General Assembly. 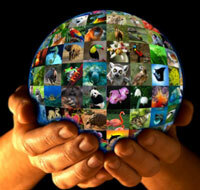 As such, we are today also celebrating the 44th Birthday of CITES! Over the past six years or so, I feel like we have been on a journey together to end illegal trade in wildlife. Some have been with us right from the start and others have joined us along the way. There is now a global collective effort underway to tackle illegal trade in wildlife, and at the global level all of the necessary elements have fallen into place to effectively combat these highly destructive crimes. We are seeing unprecedented levels of high-level political support and international and regional cooperation – and today we would like to acknowledge the efforts of the Government of the United Kingdom and the British Royal family to combat this serious threat to wildlife, including through the London Conference and initiatives such as the United For Wildlife Transport Task Force. Just looking at enforcement, we have the International Consortium on Combating Wildlife Crime, or ICCWC, that is now fully operational and actively providing coordinated support at the country level to help authorities fight transnational organised criminal groups. This includes support to apply the same tools and techniques used to combat other serious crimes – be it the use of modern forensics, enhanced investigation techniques, or tackling money laundering. ICCWC is also supporting the review and strengthening of national legislative frameworks, enhancing the capacity of national authorities’ to successfully prosecute wildlife crime offences, and raising awareness of the serious nature of wildlife crime. We are most grateful for the strong support expressed for ICCWC in the London Declaration, Kasane Statement and Hanoi Statement, as well as in the historic UN General Assembly Resolution on tackling illicit wildlife trafficking. However, the ability of ICCWC to provide support to countries relies upon adequate financing, and we express our deep thanks to the United Kingdom for the additional support it announced for ICCWC in Hanoi last year, as well as to our other generous donors. In fact, we have more mandates on tackling illegal wildlife trade than we could ever imagined just six years back. These mandates are critical to direct, guide and enable States and organizations to take action. A critical foundation for much of this effort relies upon sound national legislation, legislation that implements CITES, makes possession of illegally traded wildlife an offence, and treats illicit wildlife trafficking involving orgainsed criminal groups as a serious crime, as has been expressed in the various UN General Assembly and CITES Resolutions. The focus is now on ensuring these aspirations are given expression in legislation, a matter that has been driven by CITES, UNODC and the UN Crime Commission, amongst others. Bold decisions were taken at the 17th meeting of the Conference of the Parties to CITES (CoP17) in Johannesburg, South Africa last year on tackling illegal trade in wildlife. At CoP17, for the first time ever, dedicated decisions were taken to address corruption, cyber-crime and well-targeted demand reduction strategies, as well as enhanced resolutions on strengthened legislation and better engagement with rural communities. We now need to see equally bold concrete actions to implement them. Colleagues, all of the political, financial and technical support that has been generated over the past six years must continue to converge and translate into direct support to the frontline to implement these decisions. From where we sit there is no gap in either mandate or direction, rather the gap lies in implementation in the frontline. For example, close to 50% of CITES Parties still do not have legislation that fully meets the requirements of the Convention, which was the subject of strong resolutions and decisions at CoP17. We do not hear our frontline officers calling for new resolutions. In fact, many Parties are starting to feel overwhelmed by the sheer volume of different decisions, declarations and resolutions. What we do hear from them is a call for further assistance, especially technical and financial assistance, to implement what is already agreed. We would thus like to encourage our focus to be squarely on the frontline and implementing the existing UN General Assembly Resolutions and the outcomes of CITES CoP17, and of other conferences – and if there is to be any further UNGA resolution for implementation in the frontline to be its focus. Supporting the frontline is the clear focus of the CITES Secretariat and its partners in the International Consortium on Combating Wildlife Crime, or ICCWC. Colleagues, we are making remarkable progress in many areas. If we persist with our collective efforts we are convinced we will end the surge in illegal trade in wildlife experienced over recent years – and the figures released today on the trends in the illegal killing of elephants in Africa through our MIKE Programme shows that while much remains to be done, we are on the right track. Thank you Chair and thank you to everyone who is here today, as well as to those who are serving in the frontline, for supporting the survival of the world’s wildlife.